The Celestion Gold was originally developed as a higher power alnico speaker and is thought of as a “well played-in” version of its older brother the Celestion Blue. Exhibiting many of the same tonal characteristics as can be heard in the original Blue, the Gold has a less prominent high end which reveals a more complex upper mid-range. 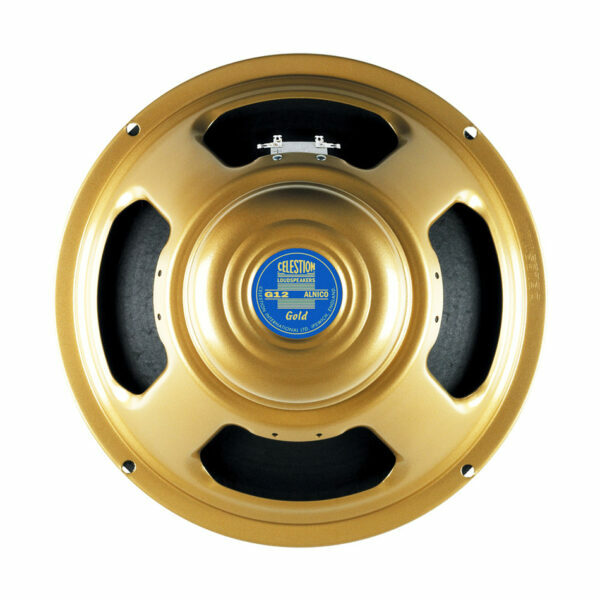 Expressive and dynamic, the Celestion Alnico Gold, a 50 Watt G12 speaker, yields unprecedented control along with the muscle needed to deliver a huge rhythmic voicing. All the qualities of an alnico speaker are still there, including a warm bass, chiming treble and a “laid-back” attack. Push a little harder and the Alnico Gold yields rich, thick overtones, harder still and you’re rewarded with a delightfully aggressive snarl with just enough natural compression to keep things sweet. Additionally we’ve included a further 8 mix IRs. The mixes were generated by combining single IRs together. This provides further options for you to create and extend your tonal palette with more awesome sounds. Look here for all the background you need on the microphone placements and combinations. The IR files are delivered in .wav format, making them compatible with most popular convolution plug-ins. You can find out more about software and hardware compatibility by navigating to this page.